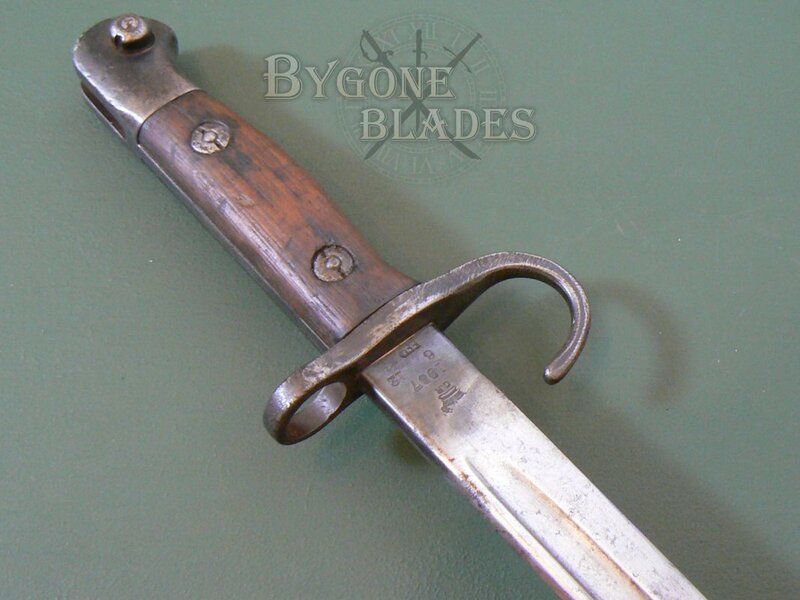 British P1907 First Pattern Hooked Quillon Bayonet. 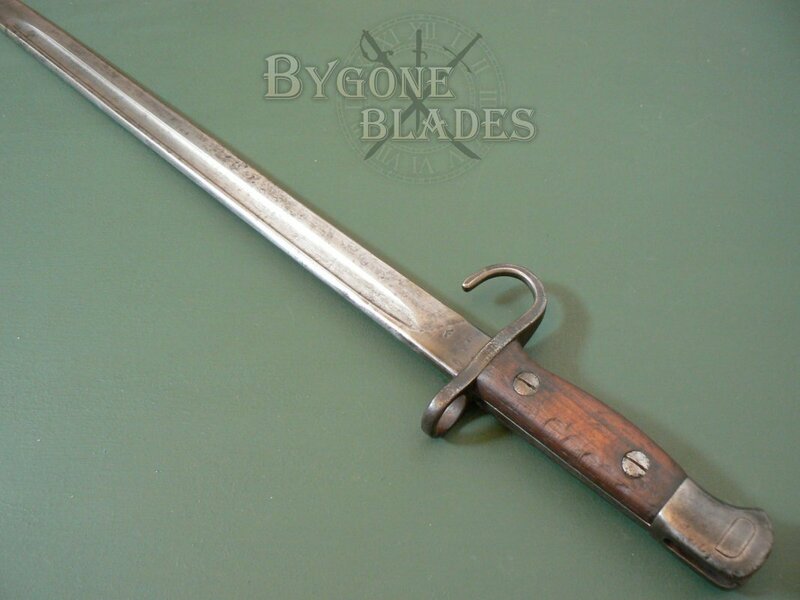 Enfield 1912. 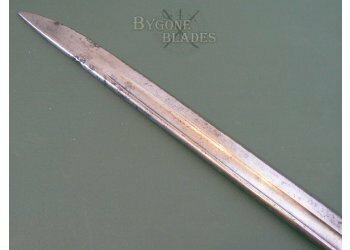 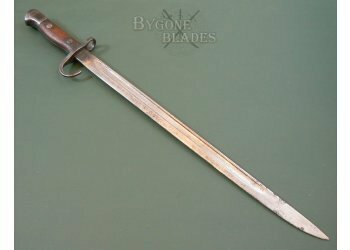 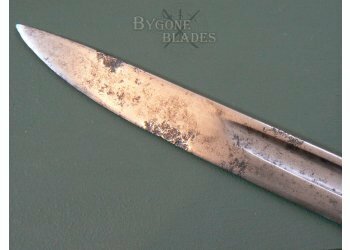 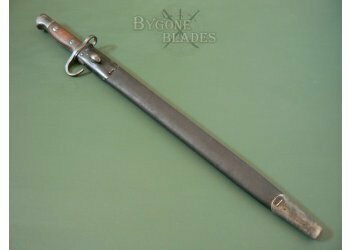 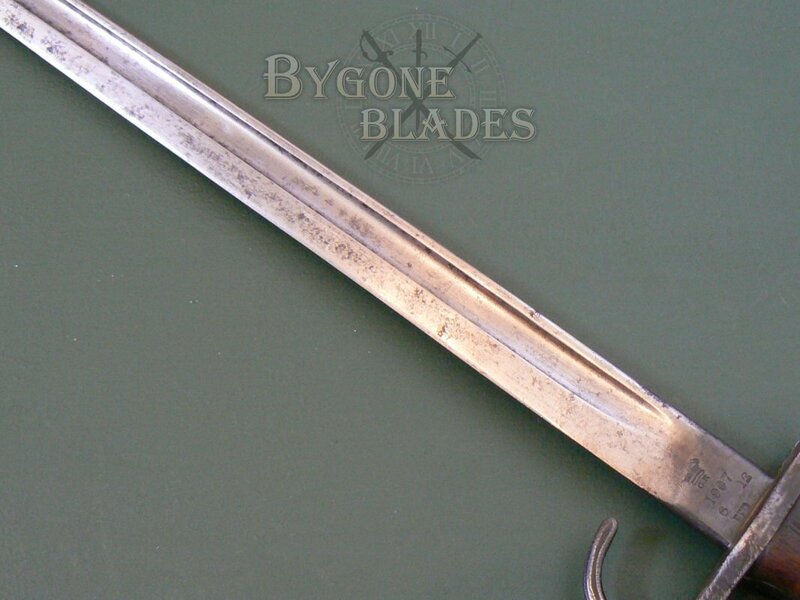 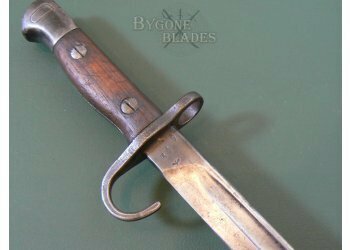 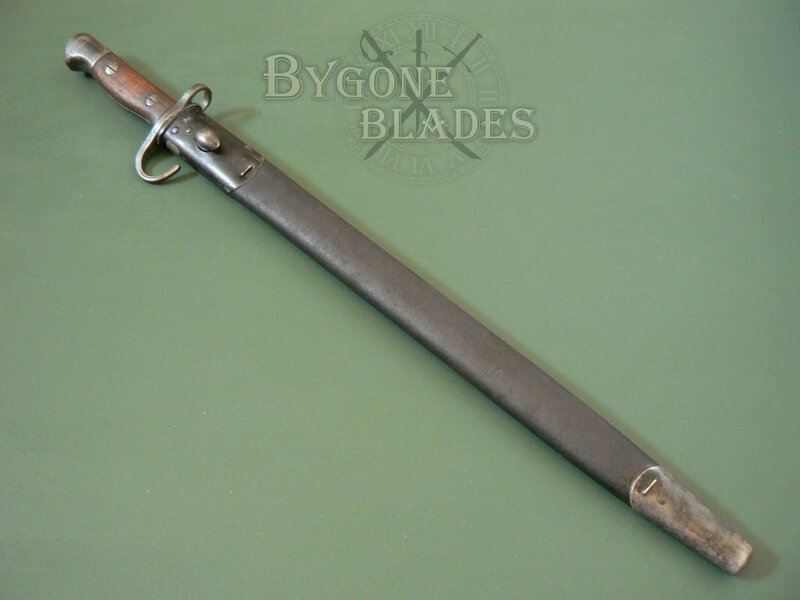 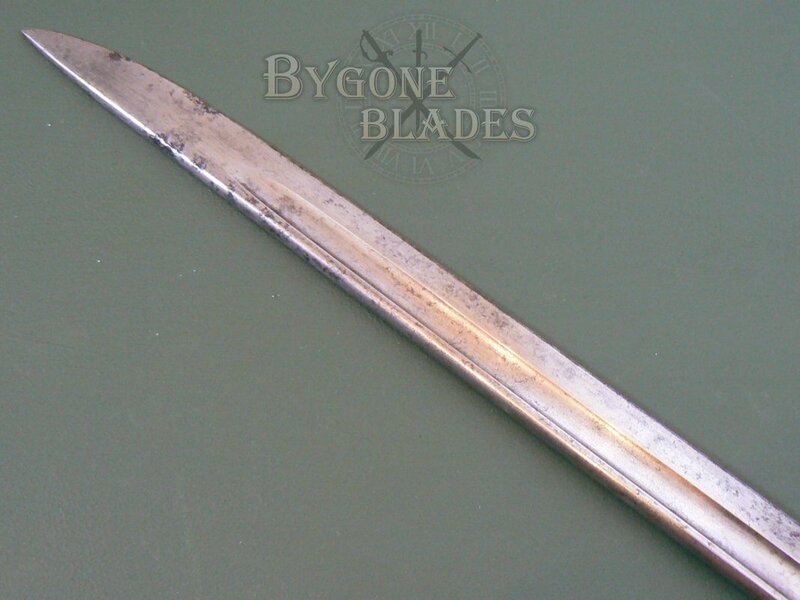 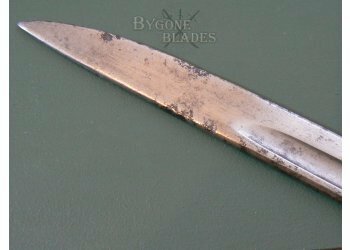 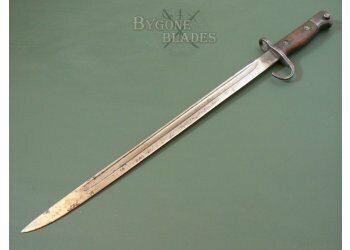 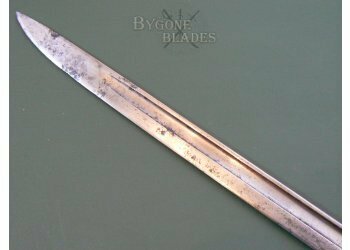 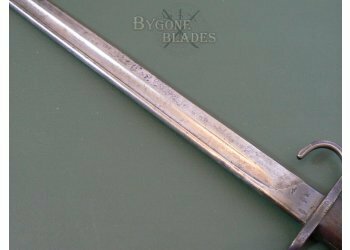 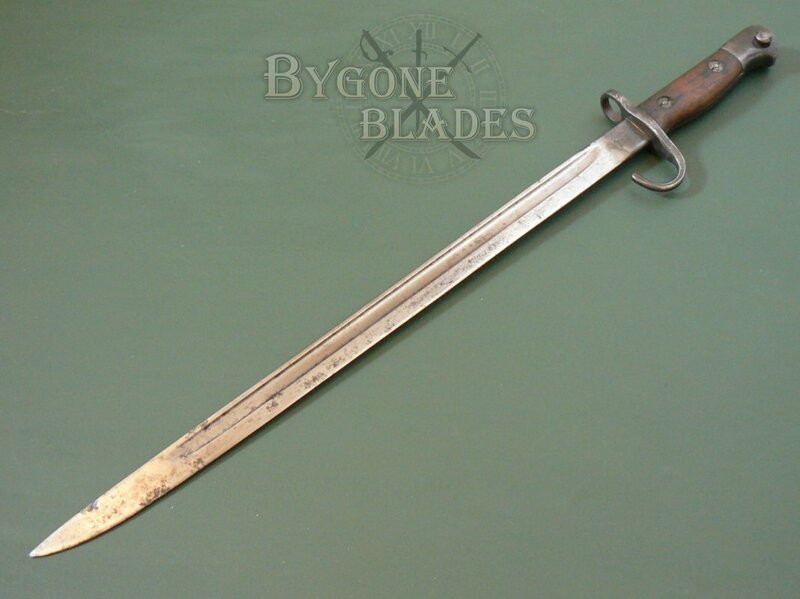 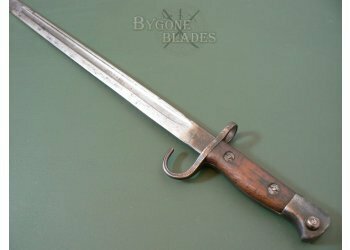 Shop » Bayonets And Knives » British P1907 First Pattern Hooked Quillon Bayonet. 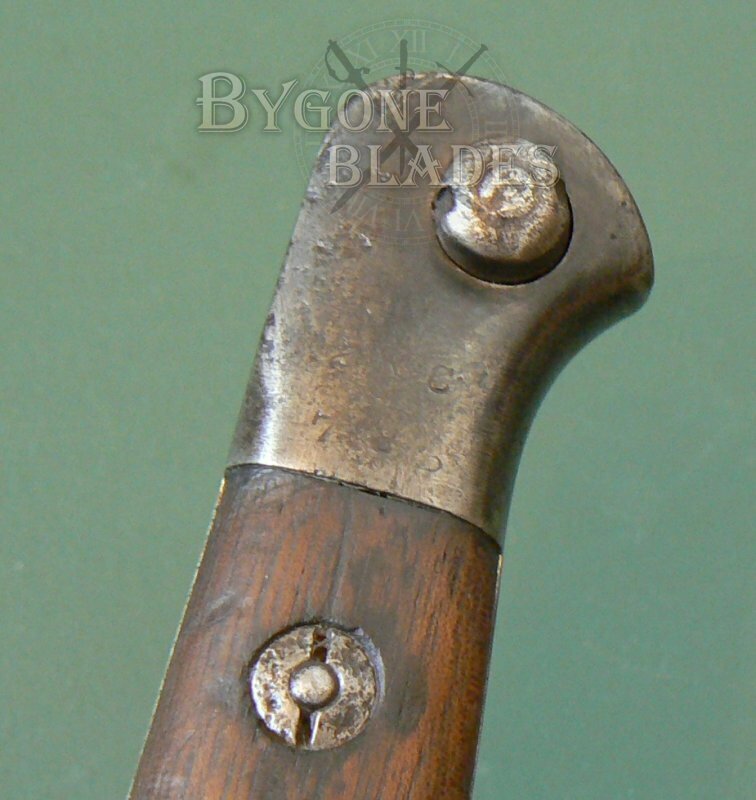 Enfield 1912. 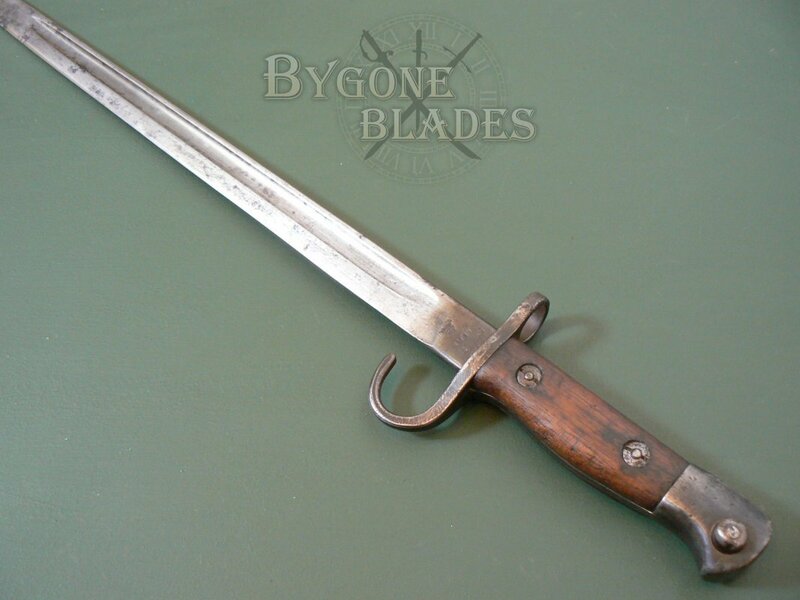 Rare pre-World War One Hooked Quillon bayonet made by the Royal small Arms factory (RSAF) Enfield in June 1912 and issued to the 2nd Battalion, R.C. 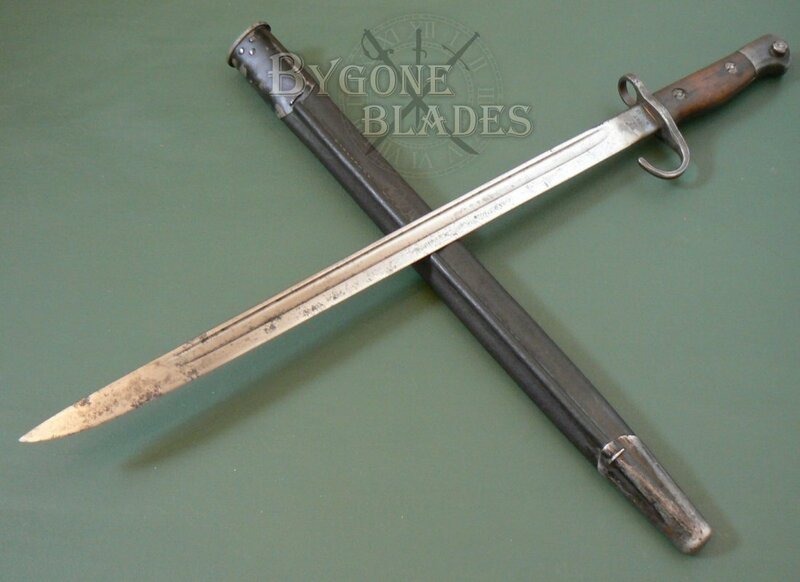 Its issue number was 7 8 ? 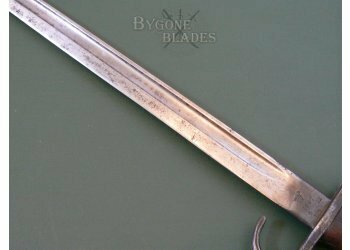 The 431mm, single edged blade has a long narrow fuller and rounded spine. 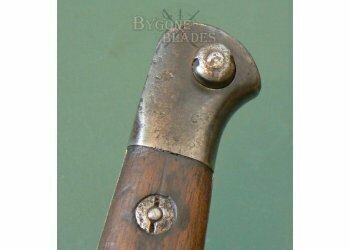 The edge was service sharpened. 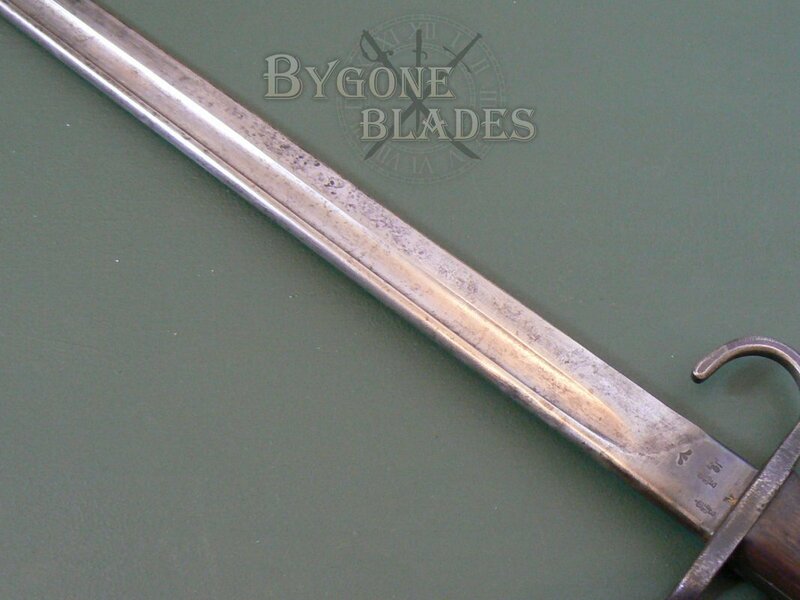 The blade is mostly bright with speckled tarnish and small areas of darker tarnishing and pitting towards the point. 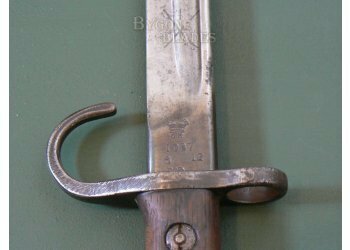 The ricasso retains much of its original blueing and is marked with a crown and GR (Georgius Rex) over the pattern date 1907 and the date of manufacture 6 ’12 below which is stamped “EFD” for the Enfield factory. The obverse ricasso bears the War Department broad arrow, bend test stamp and three inspection and acceptance stamps. 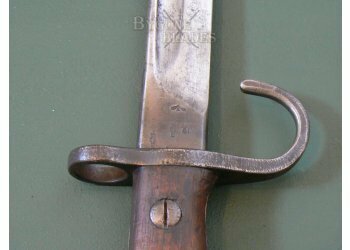 The hooked quillon and muzzle ring retain blueing, as does the steel pommel which is stamped with the regimental markings. 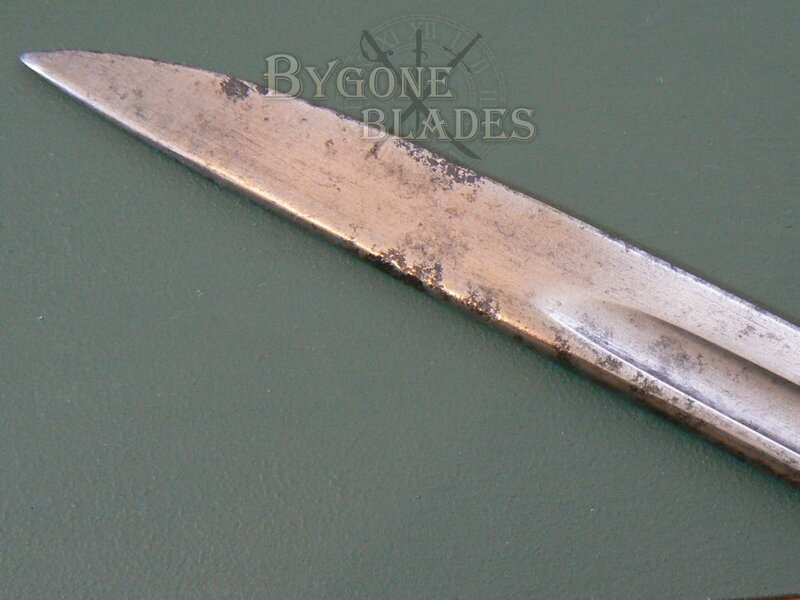 The wooden scales are in good condition with some marks, age related wear and colouration. The scales are held firmly in place by the two original screws. The push button locking mechanism is in good condition and works well. The bayonet is complete with the correct No1 Mkll black leather scabbard with a teardrop stud. 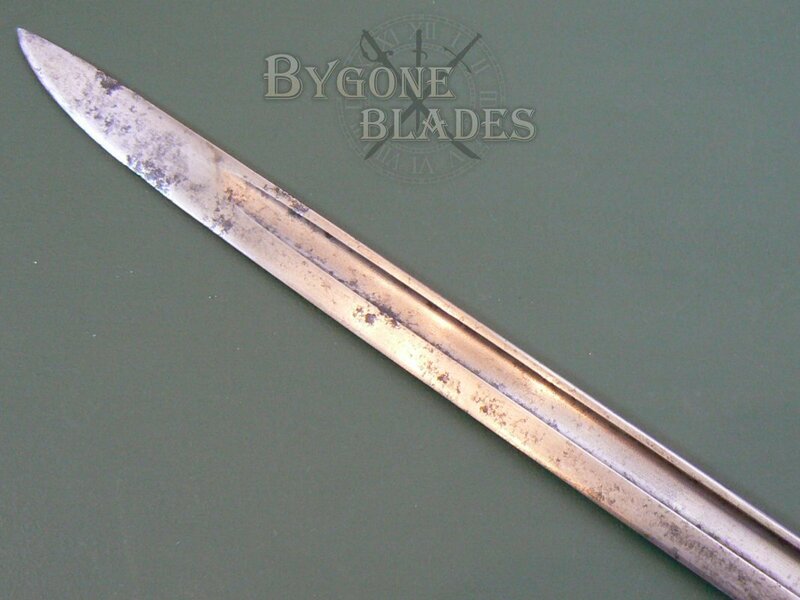 The scabbard is in very good condition. 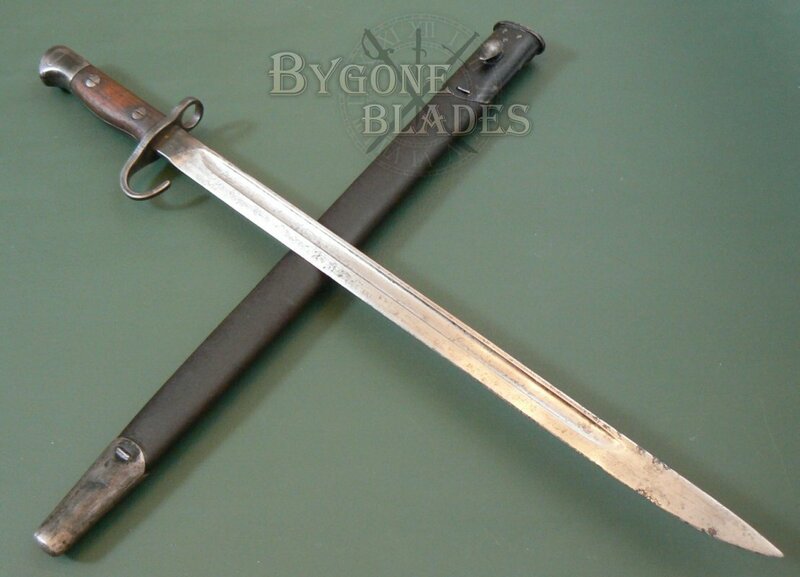 The leather and stitching are sound. 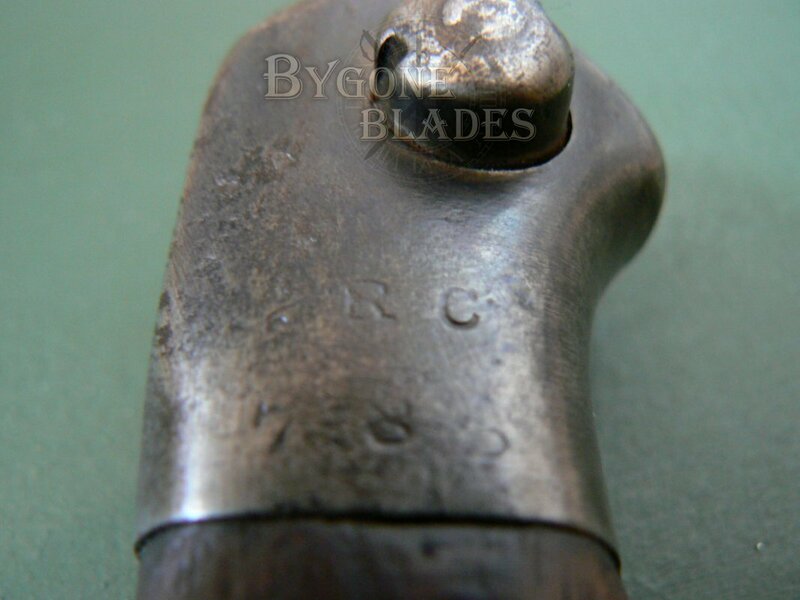 The name “B NASH” is lightly scratched into the leather beside the seam. 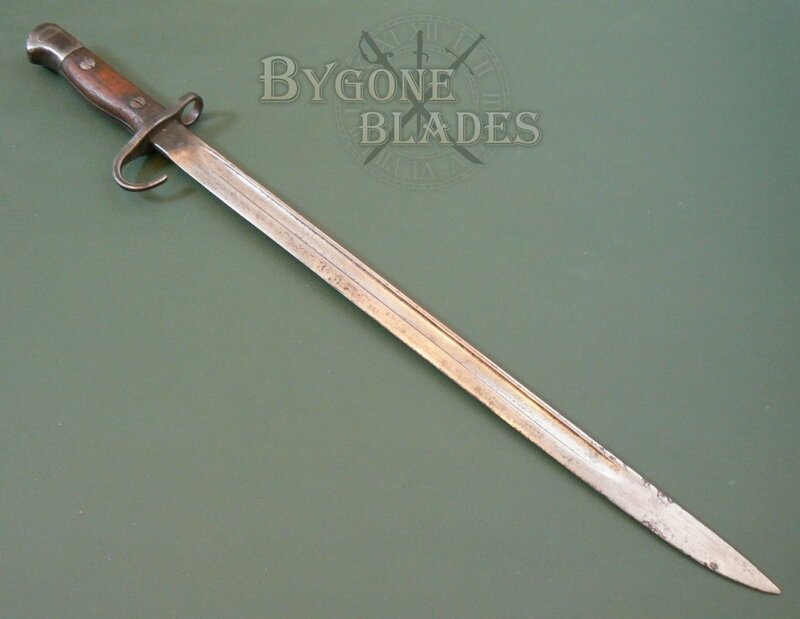 A better than average example of this iconic and rare British bayonet.